Make some new friends on this easy 3.5 mile, 2 hour hike. Have a great time while your dog enjoys socializing with other great dogs. Hike around the hilly 1.5 mile forest trail loop then take the 2 mile paved loop around the wet lands . It’s a very easy interesting hike that loops over its self, so if 3.5 miles is too far you can stop at 1.5 miles. Lots of deer to see lately. Meet at the covered Bridge. Entrance is on Old Alabama on the left ¼ mile from Holcomb Bridge Rd. Go all the way back to the brick restrooms and covered bridge parking area. Please bring water for you and your dogs. 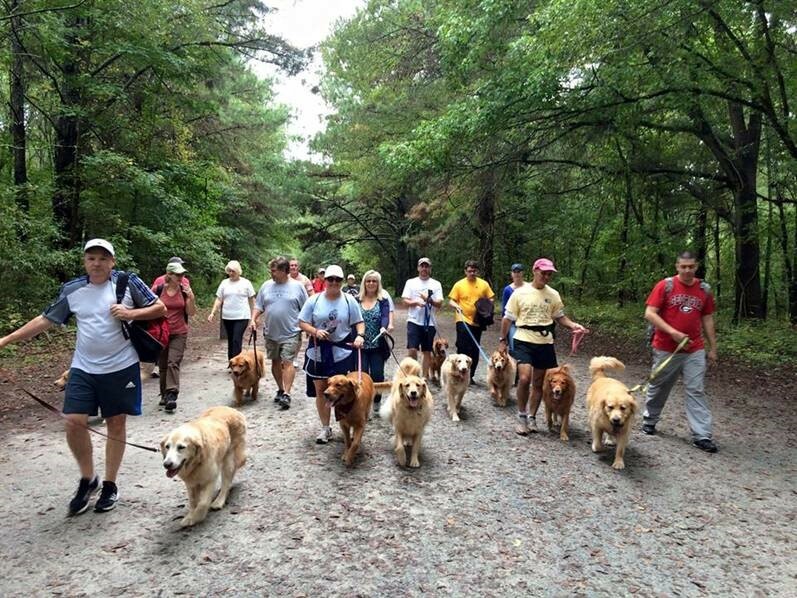 Please RSVP Ken at hikes@GRRA.com or the Paws on the GRRA Paws on the Path Facebook page If you're running late call Ken at (678) 777-4295 See all our hike information Sign up with GRRA Paws on the Path on Facebook. Click: Join Group. We will set you up and approve. Join us for this easy 3.0 mile, 2 hour hike. Have a great time while your dog enjoys socializing with other great dogs. Hike the paved paths of Miller Lake. It’s easy walking around Miller Lake. Hopefully we will see some wildlife and if no one’s around maybe the dogs can jump in the lake. There are three entrances to the park - we will meet at the Hog Mountain Road entrance. Please RSVP with Ken - hikes@grra.com. - Play in the rushing creek Have a great time while your dog enjoys socializing with other great dogs. Join us on this 3 mile, 2 hour hike. Hike the "Moderate" forest trails along Vickery Creek. Take some great pictures of the waterfall. - Bring water for you and Fido. - Don’t forget a leash. - Turn right onto Mill St.
- Take the 2nd left onto Slone St.
- Take the 1st right onto Mill St.
- Take 120 East directly onto Mill St. Please bring water for you and for Fido. Bring a camera, parking is free. Restrooms at the park. See all our hike information-Sign up with GRRA Paws on the Path on Facebook: On your Facebook homepage, in the search section at the top, type in: GRRA Paws on the Path. Click it to open. Click: Request Membership. We will set up up and approve. Join us on this easy Sunday morning 3.0 mile, 2 hour hike. Have a great time while your dog enjoys socializing with other great dogs. Hike around the lake on a hilly 1.5 mile forest trail loop then return on the wide paved walk. It’s an easy interesting hike. Cost to get in the park is $15 a car but the scenery is well worth it. My pups loved it. Meet at the Playground Parking Lot. It is ONE WAY, so go SLOW so not to pass by the parking lot. Pick up a map at the main gate. Meet up at the children's PLAYGROUND (#5 ON THE Driving MAP). It’s One Way so don’t pass by the parking lot. Directions I-285. Once on I-285 East, take Exit 39B, the U.S. Hwy 78 East (Snellville/Athens) exit. Travel 7.7 miles and take exit 8, the Stone Mountain Park Main Entrance. Follow the exit ramp to the East Gate entrance of Stone Mountain Park. Inside the park take a right on Robert E Lee Blvd. go around the mountain to the Playground parking area. Join us on this EASY Sunday morning 3 mile, 2 hour hike and dunk. It’s an easy but interesting hike along the Chattahoochee - on a wide forest trail loop. We will let the dogs dunk in a small stream along the way. So come and have a great time while your dog enjoys socializing with other great dogs. Meet by the Parking lot restrooms. Come early as parking can be tough. - Bring all your dogs and dog loving friends. - The deer request that all dogs are leashed. - Please bring water for you and for Fido. See all our hike information Sign up with GRRA Paws on the Path on Facebook. Click: Join Group. We will set you up and approve.